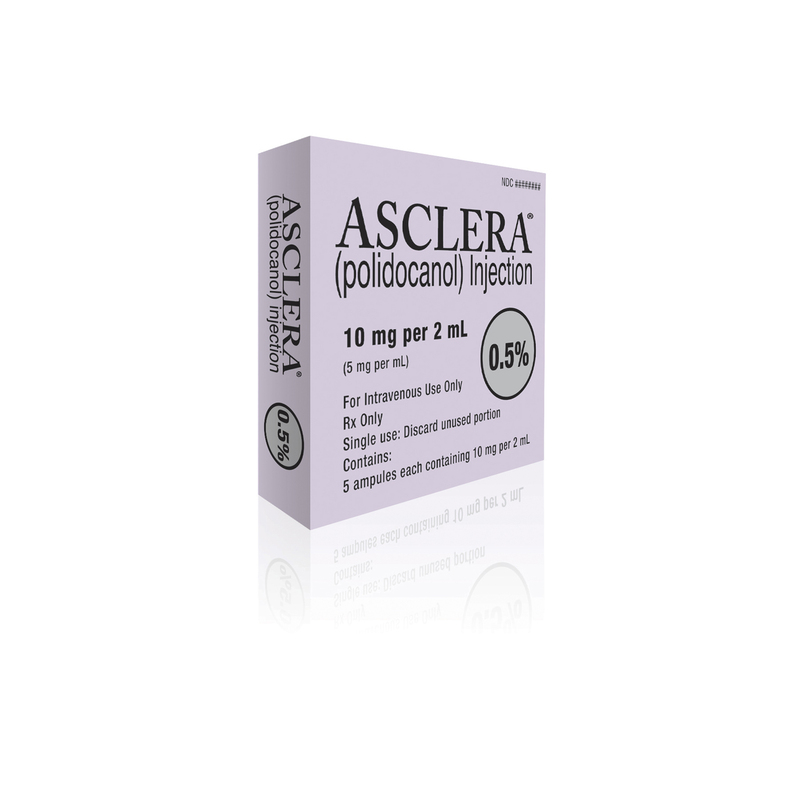 CONTRAINDICATIONS: Asclera® (polidocanol) Injection is contraindicated for patients with known allergy (anaphylaxis) to polidocanol and patients with acute thromboembolic diseases. Anaphylaxis: Severe allergic reactions have been reported following polidocanol use, including anaphylactic reactions, some of them fatal. Severe reactions are most frequent with use of larger volumes (> 3 mL). The dose of polidocanol should therefore be minimized. Be prepared to treat anaphylaxis appropriately. Accidental Intra-arterial injection can cause severe necrosis, ischemia or gangrene. If this occurs, consult a vascular surgeon immediately. Severe adverse local effects, including tissue necrosis, may occur following extravasation; therefore, take care in intravenous needle placement and the smallest effective volume at each injection site should be used. After the injection session is completed, apply compression with a stocking or bandage, and have the patient walk for 15-20 minutes. Keep the patient under supervision during this period to treat any anaphylactic or allergic reaction. ADVERSE REACTIONS: In clinical studies, the following adverse reactions were observed after using Asclera® and were more common with Asclera® than placebo: injection site haematoma, injection site irritation, injection site discoloration, injection site pain, injection site pruritus, injection site warmth, neovascularization, injection site thrombosis.